A new study from the University of North Carolina at Chapel Hill put Evanston police among the highest black to white search ratios. Evanston police were seven times more likely to search a black driver than a white one in 2014, according to a recent study from the University of North Carolina at Chapel Hill. 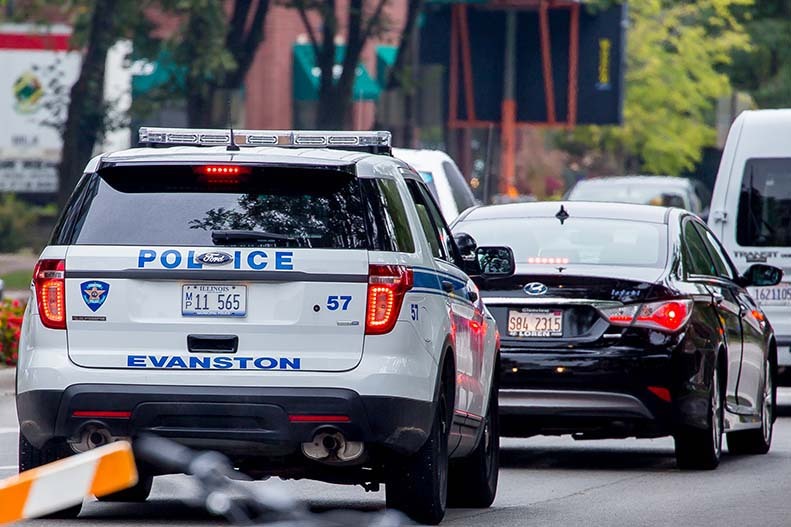 The study, which analyzed traffic stops from 132 police agencies across 16 states, found that Evanston police consistently had the highest black to white search ratio of any other department. Evanston police in 2009 were also roughly 11 times more likely to search a Hispanic driver than a white one. Baumgartner said he conducted the study based on traffic stop data made available by various police agencies across the country. Out of the 16 states included, he said, Illinois had one of the most “robust” and complete data sets. Evanston police Cmdr. Joseph Dugan said the study represented only a small piece of a larger “dynamic and complex” crime picture in the city. Between 2009 to 2014 — the time period used with regard Evanston by the study — he said police were trying to stop an ongoing “gang conflict” in which most of the people involved were “minority individuals.” Dugan said he believes the conflict partially accounted for the racial discrepancy in searches. Earlier this year — after a video portrayed the contentious arrest of Northwestern graduate student Lawrence Crosby — some Evanston residents told The Daily that police unnecessarily escalate routine scenarios and treat minorities differently. Black people make up 61 percent of arrests and 73 percent of contact cards, which document police stops, according to 2015 Evanston police data. Police Chief Richard Eddington, however, told The Daily in January that EPD did not have an issue with race. Eddington pointed out that black officers make up roughly a quarter of the police force, compared to 18.1 percent of the city’s total population. But Baumgartner said the problem likely had more to do with “institutional practice” than individual officers. During routine traffic stops, he said, police in the country often focus on crimes associated with poverty rather than traffic safety. In doing so, they can foster distrust and animosity in affected communities. Dugan denied that the department had a particular problem with race and said officers “constantly” work to eliminate issues such as implicit bias and institutional racism. After criticism from community activists and some aldermen, Evanston officials last month presented a series of policy changes geared toward de-escalation training and diversity and inclusion. Some of the changes included: a pilot body camera program starting July 1, reforms to the citizen complaint process and transparency in the form of publicly-released police data. At a Human Services Committee meeting Monday evening, many residents expressed concern about the study during citizen comment. Northwestern junior Adam Gross — standing with Associated Student Government president Christina Cilento and executive vice president Macs Vinson, as well as co-vice president of student life Benjamin Powell and political science Prof. Karen Alter — read a statement signed by more than 25 NU community members in response to the study. Gross criticized Mayor Elizabeth Tisdahl’s response to the study, referencing a public Facebook post in which she highlighted the potential benefits of traffic stops. Gross said that while Tisdahl in her post acknowledged questions about Evanston policing, she also justified the amount of traffic stops targeted toward people of color. Gross encouraged the remaining two mayoral candidates, Ald. Mark Tendam (6th) and businessman Steve Hagerty, to put police accountability reform at the top of their platforms. This story was updated to clarify that political science Prof. Karen Alter was also standing alongside students at the Human Services Committee meeting to deliver a statement signed by members of the NU community.